“Ensuring Long-Term Preservation and Adding Value to Scientific and Technical Data” – PV 2013 – welcomes you to its seventh edition. Previous events were held at CNES in Toulouse (PV2002), at ESA-ESRIN in Frascati (PV 2004), at DCC in Edinburgh (PV2005), at DLR in Oberpfaffenhofen (PV2007), at ESA-ESAC in Madrid (PV2009) and then again at CNES in Toulouse (PV2011). 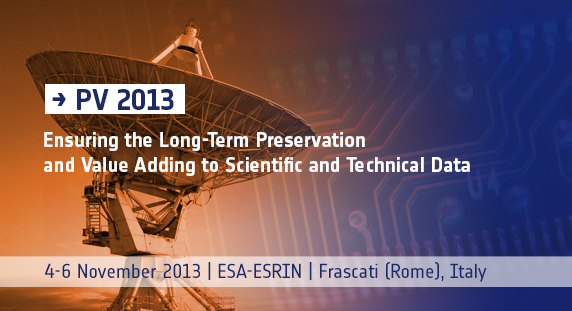 For its seventh edition, the conference series is back to ESA-ESRIN in Frascati to continue addressing prospects in the domain of scientific and technical data preservation together with value adding to these data. Scientific data access, comprehension and interoperability is vital to tackle the challenges the scientific community is facing. As an example, certain environmental analysis, like those supporting the long-term climate change variables measurement, requires historical data records to be periodically reprocessed to conform to the latest revisions of scientific understanding and modelling techniques. This in turn requires access to and understanding of the original processing, including scientific papers, algorithm documentation, processing sources code, calibration tables, databases and ancillary datasets. Proper data management, data description and data curation remain the challenges for building modern archives while keeping in mind their long-term preservation. Coupled with flexible and open software architecture, these are the basis to allow interoperability amongst archives while enabling the development of new added value services and applications on top of existing data, ensuring its higher utilization by end (and new) users. Session 4: Future prospects and cooperation. The DCH-RP project will attend the conference by exposing its poster in the PV2013 poster session.